The Relais Azuni is on the top floor of an elegant building located in the historic Stampace district. It has three comfortable, bright and panoramic rooms. The Relais Azuni is located in the historic Stampace district in an elegant building. It is situated a short walk from the railway station, port, bus terminal and regional buses and it is 10 minutes drive from the international airport of Elmas. 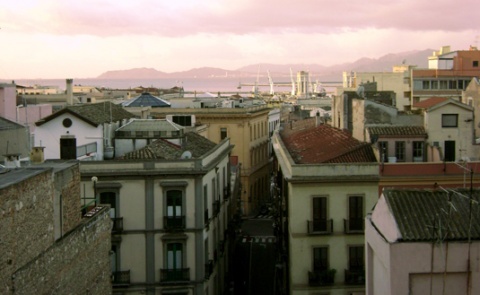 It is closer to major banks, Chamber of Commerce, headquarters of the Regional Council, City Hall, University of Cagliari and the Faculties of Architecture, Botanic, Economics, Pharmacy, Law, Languages and Literature, Medicine and Surgery, Political Sciences. Thanks to its many shops, restaurants, pubs, bars, and nightclubs, it is ideal for shopping and entertainment. Optimal solution for tourist travel, being able to reach easily places of culture, sea and mountains. The Relais Azuni consists of three rooms of different dimensions and characteristics, with elegant and simple furnishing. As they are on the top floor, they are very bright. Room about 15 square meters with a French bed, bathroom with shower. Very bright, it looks out from one side on the old roofs of the neighborhood Stampace, dominated by the imposing church of San Michele, and from the other on a wide courtyard, through two windows. It is equipped with large wardrobe, desk, small library, TV LCD 24 ". Large room about 24 square meters with double bed, bathroom with shower. Very bright, it looks from one side on the baroque Church of St. Michael and from the other on the ancient Castello district. It is equipped with large wardrobe, desk, sofa-bed, 32 "LCD TV. Spacious room 25 square meters with double bed, private French bathroom about 10 square meters with shower and Jacuzzi for two people. Very bright, it overlooks the picturesque port of Cagliari. It is equipped with large wardrobe, desk, bookcase, 32 "LCD TV.